This toy is sure to drive your dog crazy and make him drool. 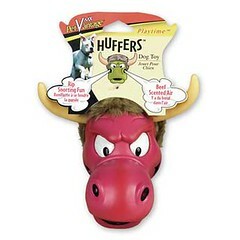 The VMX PetVantage Playtime Huffers Dog Toy is a vinyl toy that is shaped like a raging bull head and when it is pressed, the toy releases beef-scented air from the nostrils. Your dog may think of it as more of torture instead of fun. This entry was posted on Thursday, May 3rd, 2007 at 3:58 am	and is filed under Dogs, National Dog, Cat & Pet Info, Products & Services for Cats & Dogs. You can follow any responses to this entry through the RSS 2.0 feed. Both comments and pings are currently closed. It apparently also comes with a toupee.